Revolution Day, (el Día de la Revolución) is celebrated every year in Mexico on November 20th. On this day, Mexicans remember and celebrate the Revolution which started in 1910 and lasted for about ten years. The holiday is sometimes referred to by its date, el veinte de noviembre (the 20th of November). The official date is November 20, but nowadays students and workers get the day off on the third Monday of November, no matter which date it falls on. This is a national holiday in Mexico in commemoration of the beginning of the Mexican Revolution. The revolution began in 1910, initiated by Francisco I. Madero, a reformist writer and politician from the state of Chihuahua, in order to oust President Porfirio Diaz who had been in power for over 30 years. Francisco Madero was one of many people in Mexico who were tired of Diaz' authoritarian rule. The period of Diaz rule is known for its technological and industrial advances, but during that time, a few prospered and many suffered in poverty with very low wages. Along with his cabinet, Diaz was aging while holding tightly to the reins of the country. Madero formed the Anti-Reelectionist Party and ran against Diaz, but the elections were rigged and Diaz won again. Diaz had Madero jailed in San Luis Potosí. Upon his release, he fled to Texas where he wrote the Plan of San Luis Potosi, which urged the people to rise up in arms against the government in order to reinstall democracy in the country. The date of November 20th at 6 pm was set for the revolt to begin. A couple of days before the planned date of the insurrection, the authorities discovered that Aquiles Serdan and his family, who lived in Puebla, were planning to participate in the revolution. They had been stockpiling arms in preparation. The first shots of the revolution were fired on November 18 at their home, which is now the Museo de la Revolución. The rest of the revolutionaries joined the fight on November 20th as planned, and that is still considered the official beginning of the Mexican Revolution. In 1911, Porfirio Diaz accepted defeat and left office. He departed for Paris where he remained in exile until his death in 1915 at the age of 85. Francisco Madero was elected president in 1911, but he was assassinated just two years later. The revolution would continue until 1920 when Alvaro Obregón became president, and there was relative peace in the country, although outbreaks of violence would continue for several more years, as not everyone was satisfied with the outcome. One of the mottos of the revolutionaries was "Sufragio Efectivo - No Reelección" which means Effective Suffrage, No Reelection. This motto is still in use in Mexico today and remains an important feature of the political landscape. Mexican presidents serve for a single six-year term and are not eligible for re-election. Another important slogan and theme of the revolution was "Tierra y Libertad," (Land and Liberty), with many of the revolutionaries hoping for land reform, since much of the property of Mexico was held in the hands of few wealthy landowners, and the vast majority of the population was forced to work for very low wages and in poor working conditions. Large-scale land reform did come into place with the Ejido system of communal land ownership which was instituted following the revolution, although it was implemented over the course of many years. The Mexican Revolution is seen as the event which forged modern Mexico, and the commemoration of Revolution Day in Mexico is marked with parades and civic ceremonies throughout the country. Traditionally a large parade was held in Mexico City's Zocalo, which was accompanied by speeches and official ceremonies, but in recent years the Mexico City celebrations have been held in the Campo Marte military field. 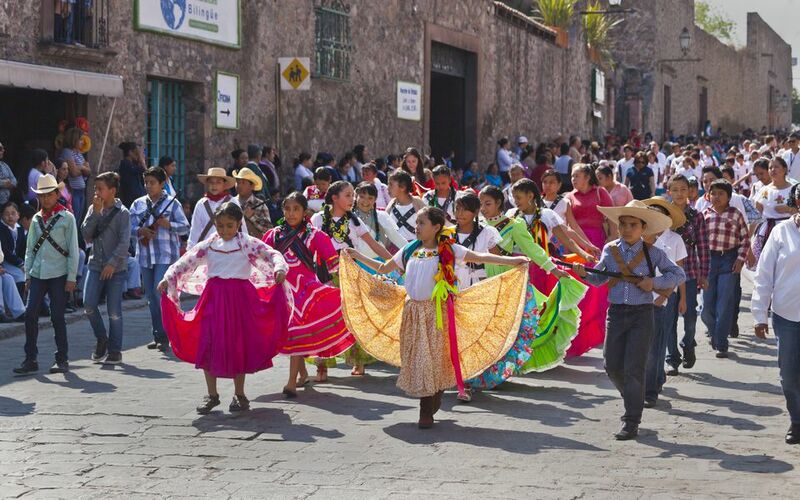 Schoolchildren dressed as revolutionaries participate in local parades in cities and towns throughout Mexico on the date. In recent years, many stores and businesses in Mexico have been creating promotions around this holiday, dubbing it el Buen Fin ("the good end," as in weekend), and offering sales and offers similar to the way Black Friday is celebrated in the United States.